I want to custom order one of your hand painted signs. What do you need from me? Can I see a proof of my hand painted sign before you paint? Why do you paint your signs and windows? Wouldn’t vinyl be easier? What kind of paint do you use for your hand painted signs? I want a personal sign for my home. Do you make those too? How much does a hand painted sign cost? How much does a window painting cost? What kind of paint do you use for window painting? Do you paint on the inside or the outside of windows? How long does a window painting last? How do you remove window paint? Do you paint on boats, trucks, or other vehicles? 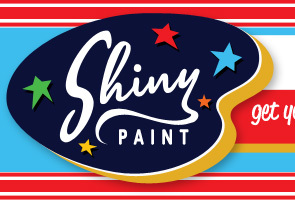 You can use our contact form or email us at info[at]shinypaint.ca with some details of what you are looking for. Send us a description of what you want including the words and images to be included and you can email any artwork to be used in your sign. Any information you can give us such as size, and the purpose of the sign and budget will help us to give you a custom quote. Now let’s get started! Of course! We always show a sketch ahead of time for your approval before dipping our brushes in the paint. Well, first of all, we love painted signage and think it still has a place in our digitally saturated world. And it’s actually easier for us, because we don’t need any special machinery – just our own hands, basic tools, some squirrel-hair brushes (yes, really!) and some awesome paint. The majority of our signs are painted with high quality enamel paint on a signboard substrate called MDO (medium density overlay). These are long lasting, traditional materials that are still the industry standard for painted signs. Remember, all signs were hand painted before the introduction of the vinyl plotter in the ‘80s – and there are lots of old painted signs that can still be found today, even painted outdoors on brick! For interior signs and menu boards, we do use chalk and acrylic from time to time if the project calls for it. Sure! Though we often make signs for businesses, we also make signs for bedroom doors, cottages, gardens – doesn’t matter to us! Contact us to get started on your particular sign project. We price all our signs individually based on the size and complexity of the design (amount of lettering, colours, and imagery). If you have a budget, we will work with you to create a design to suit it. Contact us with your ideas, size, and any artwork (logos etc.) to get a custom quote. As with our hand painted signs, we price all our window paintings individually based on size and complexity of the design, and some other factors such as accessibility of the location. Special prices can be set for recurring seasonal work. We often like to see your location in person, but we can usually give you an estimate if you contact us with your idea, a photo of the window(s) and the dimensions. The majority of our window paintings are for temporary advertising purposes (although many of our “temporary” paintings last years in the right conditions). We use various latex and acrylic water-based paints, which are durable but also easy to remove with water and a scraper. For those looking for permanent window signage, we use enamel paint for a long-lasting, washable result. We do both, but our preference is to paint outdoors when possible for the most bold result. It is also easier for cleanup. Sometimes, an indoor painting is the best choice – a second floor window, for instance, or a window with no cover and harsh weather conditions – in which case we paint on the inside of the glass, from reverse! In the right conditions, window paintings (also called window splashes) can last for months, even years! The paint can withstand rain even without cover, and in a sheltered area they fare even better. Since the paint is easily removed, many of our customers take advantage of this by changing the design seasonally. If you are looking for a more permanent design on your window, we have options such as painting with enamel or painting on the inside, which we can discuss when you contact us about your window. Our window splashes come off easily with a few tools/techniques! If you want to remove it yourself, you’ll find it helpful to watch our Window Removal Video first. If you feel you’d rather not worry about it, we offer a removal service and we’d be happy to help! Studio visits are by appointment only, as we are often on location painting a window somewhere or installing a sign. Contact us to set up a time. Yes! And walls, and furniture...we’ve even painted a design on a floor! We are open to painting on any suitable surface.